As a Jew By Choice, I understand where you are coming from. You may be concerned about being turned away. You’re not certain what Jewish movement you should align yourself with — because you feel too unique for that! You want something “valid” but aren’t sure what that is. I’m here to help you relieve all that stress. Because here, you’re loved and wanted. As far as I am concerned, you are already Jewish and just have one more step to take. I took that step too. Let’s take it together. 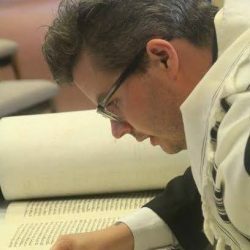 I am the community rabbi for Kehillah, an independent-progressive Jewish community in Richmond, VA. By converting with me, you will have a supportive community as part of your spiritual journey. In fact, we throw a party for you after your conversion is complete! I have been a rabbi for over five years and a Jewish educator for a decade. I was ordained a post-denominational rabbi, so I am comfortable engaging with you on everything from Orthodox Hasidism to Secular Humanistic Judaism. My training previous to ordination was with a Conservative rabbi. My own personal spiritual development has included independent minyanim, and I feel most at home philosophically with Classical Reform and Reconstructionist Judaism. My lovely wife and I spend countless hours watching TV, trekking through state parks and farmers markets, and playing with our cats Maggie and Toes. Parents must teach their children Judaism using our Family Conversion Program, but I am here to assist you as needed with other materials. I am happy to work with people in interfaith relationships of any kind, so long as the partner is supportive of your conversion to Judaism.